Rosehip oil has long been hailed as the holy grail of skincare, embraced for it’s ability for restoring moisture, reducing the signs of ageing and stretch marks, and giving that radiant glowing skin that we all love. But, it is important to note that not all oils are created equally. Highly acclaimed brand [A’kin] has been a market leader, producing organic/natural skincare for over ten years. So what makes [A’kin] Rosehip Oil different from other products? The key to [A’kin]’s certified organic Rosehip Oil’s efficacy, lies in the supercritical [CO2] extraction method, which works without the stress of high temperatures, to achieve the purest most potent oil is recovered. [A’kin]’s highly potent formula contains omega’s 3, 6 and 9, which are highly successful at helping fight the appearance of wrinkles as well as intensively hydrating the skin. The Provitamin A and vitamin E, also ensures your skin stays soft and smooth. Many people with problem areas, oily skin, or acne can be hesitant to put an oil onto their skin. Don’t be! [A’kin] Rosehip Oil helps to re-balance the oil in the skin, restoring the natural oil production levels, whilst it can also help to reduce the appearance of scarring. The [A’kin] Rosehip Oil features a dropper, perfect for dispensing just a small amount, and ensuring ultimate skin hygiene (which we know is all important in skincare). Remember, it’s top quality ingredients ensure that it is highly concentrated, and a little goes a long way. The scent is subtle, not at all over-powering (which I personally like), and can be best described as woody and natural. Once applied to the face, neck (and even chest) the oil feels both lush and rich, but is absorbed quickly and completely without leaving any kind of oily residue on the skin, but leaves the skin visibly hydrated and soft to the touch. [A’kin]’s Rosehip Oil is available in health food stores, pharmacies, skincare specialists and some major retailers. RRP $19.95 for a standard 23ml bottle. 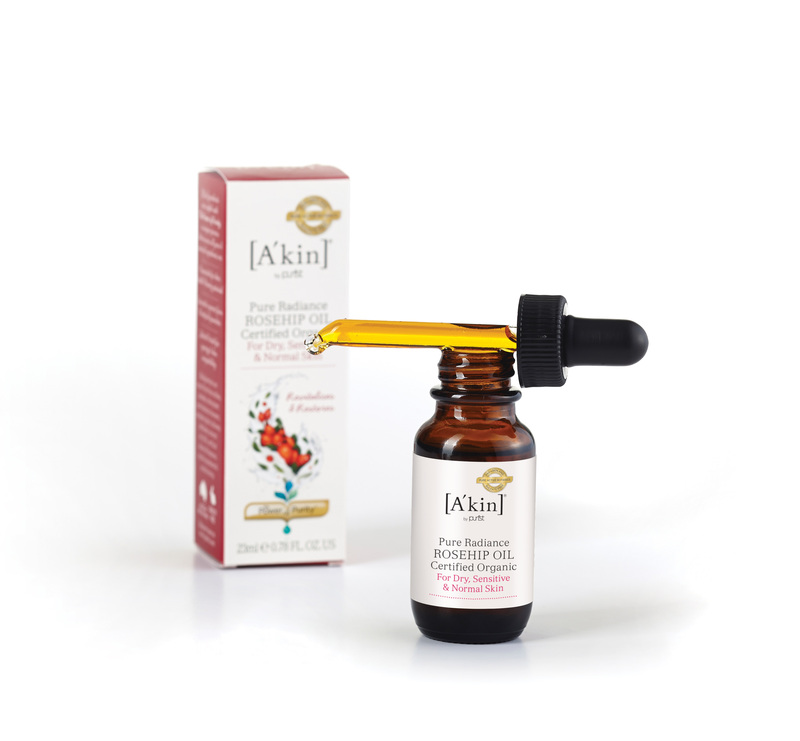 [A’kin] are offering Mums Lounge readers the opportunity to try their certified organic Rosehip Oil for themselves. We have 2 x [A’kin] skincare prize packs up for grabs including Rosehip Oil and a creamy cleanser (total RRP $49.90). 10 runners up will also be sent a sample of [A’kin]’s Rosehip Oil. To enter, simply follow the instructions on the rafflecopter widget below. Good luck.